It’s what you think you know that really isn’t true that can hurt you. 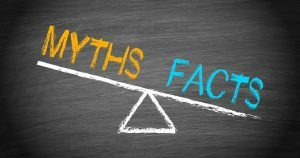 A study by the American Institute of CPAs identified twelve misconceptions that taxpayers have about their income taxes. If you apply for an extension to file your taxes, you’re more likely to be audited. Studies have never found any correlation between extending the deadline for filing and getting audited. You’re more likely to be audited if you use the preprinted label on your return. The label helps your return be processed quicker at the IRS Service Center, but that doesn’t mean it will end up in the audit bin. Don’t file your tax return until you have the money to pay the tax due. It is a crime not to file a tax return, so file your return whether or not you have the money. Generally, you can work out an installment payment plan with the IRS by requesting it on Form 9465. If your parents live in a nursing home, they can’t be your dependents. It is true that dependents who are not relatives need to live with you, but that rule doesn’t apply to your parents or your children. If you support your parents, you can claim them as your dependents no matter where they live. Money you inherit is taxable to you. If there is an inheritance tax to be paid, it is paid by the estate of the person who died, and not by you. The same is true of gifts you receive. And by the way, gifts you give to another person are not deductible on your income tax return. If you and your spouse have separated but aren’t divorced, you have to file a joint return. In actuality, you have two more options: you can file as Married Filing Separately, or if you qualify and have children at home, as Head of Household. If you file jointly, you’ll be liable for all the taxes on the return, not just your share. It’s smart to get as many tax deductions as possible. Most people pay less than a third of their income in income taxes, and so a tax deduction will only save a fraction of what it costs. Don’t put off refinancing your home because you don’t want to lose the higher interest deduction, and pay off that mortgage if it makes economic sense to do so. A pay raise can actually cost you money because it pushes you into a higher bracket. Indeed, you may jump into a higher bracket, but that is only for your income in excess of a certain amount. The income you earn below that amount will continue to be taxed at the lower tax brackets you are used to. Tax-exempt income will never be taxed. Gotcha! Some states tax income that is exempt from federal taxes, and tax-exempt income, though not taxed itself, may form an income platform that causes a greater portion of other income, such as Social Security benefits, to be taxed. You can use cancelled checks to prove that you gave money to charity. The law changed a few years ago, and now you must have a written acknowledgment from the charity if your gift is $250 or more. By the way, did you know that WIFE is a charitable organization, and so all of your gifts to us are tax-deductible! Forget about making a deductible IRA contribution if you have a retirement plan at work. Definitely not true. For 2008, if you are covered by a retirement plan at work, you can deduct contributions to a traditional IRA as long as your modified adjusted gross income (AGI) is less than $105,000 for a married couple filing a joint return ($63,000 for single or head of household). If your income exceeds that amount, you can still make non-deductible payments into your IRA, and you can contribute to a Roth IRA regardless of your benefit program at work as long as your AGI is less than $169,000 for a joint return or $116,000 if single or head of household. All the taxes you pay are tax-deductible. You can deduct property taxes, and you can deduct either your state income tax or your sales tax on your federal tax return. You get no deduction for gas tax, and the only portion of your vehicle registration that is deductible is the portion that is personal property tax. 150 Ways to Save Taxes Through Life’s Transitions.